Prototype of the Hermes structure (Credits: STAR Systems). Do it yourself spacecraft are becoming more common, but the Hermes is the first to show up on Kickstarter. STAR Systems is looking for $20,000 to build and test a full size hybrid rocket motor for the suborbital spacecraft. The Hermes is a project from STAR Systems, founded by engineer entrepreneur Morris Jarvis who first conceptualized the Hermes in 1978. 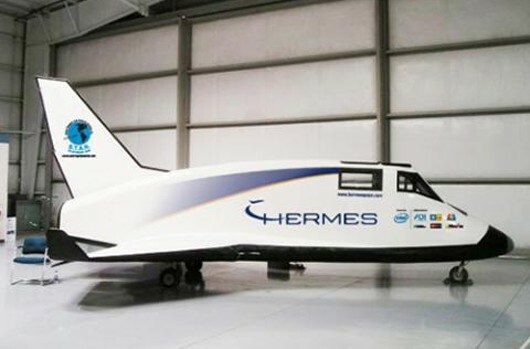 Not to be confused with the European spaceplane of the same name, the Hermes spacecraft is intended to provide affordable suborbital flights for tourists. “There aren’t too many people who get to be astronauts,” explains Jarvis on STAR’s website. “I think anybody who wants to fly into space should have that opportunity.” The Hermes has a strong Space Shuttle heritage and the STAR team actively aims to incorporate lessons learned from that spacecraft. Kickstarter is an organization that enables crowd funding of creative projects. An individual posts a project, a funding goal, and a deadline. If contributors pledge enough money by the deadline, the project gets funding. In return for different contribution levels, project owners offer small rewards to encourage donations. The Hermes project is requesting $20,000, offering rewards ranging from stickers and tshirts up to a round trip to the test fire site and a chance to press the ignition button. So far, 55 contributors have donated almost $2,000. The Hermes funding drive expires on April 28.